Today, Akron-Canton’s Fox 8 City Voter announced Ultragloss as The Best Detailing shop in 2013. We want to thank all of our customers who continue to support the business we take so much pride in! We especially want to thank our head automotive detailer who makes this possible, David Benson. Thank you for all of your hard work David!! We always strive to deliver our customers a quality service at an affordable rate. 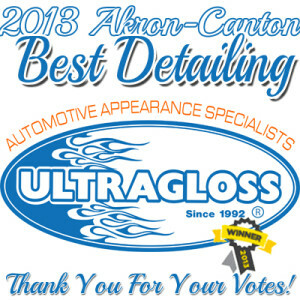 Our detail department shines with every service and apparently, we’re not the only ones who think so!